We were honored to have a shared a little bit about what we do with a fantastic group of fellow law enforcement officials last Tuesday. 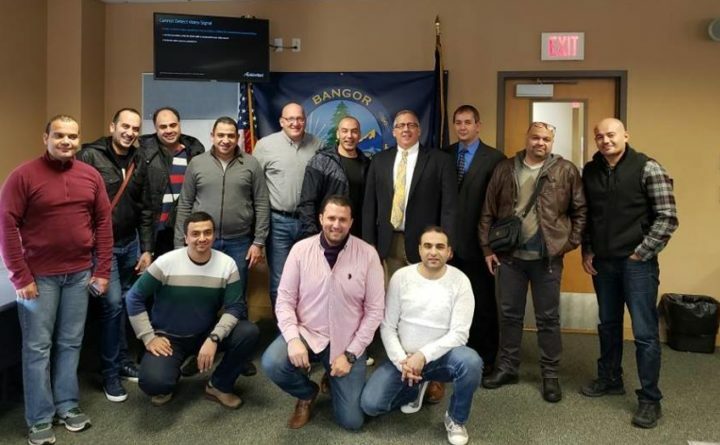 The police officers from the Egyptian Ministry of the Interior (no, you go try to find them on Facebook) were in the United States to learn more about how their American counterparts conduct investigations, and in our case, to learn about our computer forensic investigation techniques. We also presented an overview of using Facebook and other social media platforms for outreach as that is a completely new concept in some parts of this world. The delegation was escorted by one of our former partners along with his compadres who are representatives with Homeland Security Investigations-attache- Cairo, Egypt. We call him Brock- mainly because that is his name. Brock was accompanied by his boss from the Cairo detachment. His boss seemed suitably impressed that Brock still could find Stephen King’s house during the bonus impromptu tour which was provided for our friends during their ride here from Boston. I would like to thank Special Agent Greg Kelly from the Bangor office of HSI, and Sgt. Brent Beaulieu of our Criminal Investigation Division for their impressive presentations. Mine was done using only two erasable marker-the first one dried up mid-stroke- and was overshadowed by my failed attempts to say something intelligent in English. This is the part where we thank Rashad; we could not have done this without him. Rashad promised to make us sound more intelligent as he miraculously translated our words into something others, from Egypt, could understand. Sgt. Beaulieu and I have never taught while using an interpreter- except for that one occasion when a man told us he was the Doberman-liaison of Pittsfield while we were out of town on a robbery investigation. We were not bitten-so the guy knew his stuff. Rashad made the whole event flow nicely and helped us through the question and answer period. I did note that there were several times that Rashad’s eyebrows moved upward while listening to us. This is an indicator that Rashad was somewhat surprised that we were allowed to present at all. Kidding- this man was great and we appreciate his help. We all gathered for photos and the world-wide accepted cop tradition of fake salutes and back-slapping. Cops are the same the whole world over. When Beaulieu and I get to Cairo we are looking these guys up. Thanks again to the great folks at HSI- Cairo, Egypt for their help in pulling all of this together. Be especially kind to the interpreter.